Another bitter sorrow of these souls is caused by the reflection that God had distinguished them by so many graces not granted to others, and that they compelled Him, by their sins, to condemn them to these sufferings, and that they had deserved hell, and were pardoned and saved only by the mercy of God. O my God! I also am one of these ungrateful beings, having received so much grace, and yet despised Thy love, and deserved to be cast by Thee into hell. But Thy infinite goodness has spared me until now. Therefore, I now love Thee above all things, and I am heartily sorry for having offended Thee. I will rather die than ever again offend Thee. Grant me the grace of holy perseverance. Have compassion on me and, at the same time, on the holy souls suffering in Purgatory. 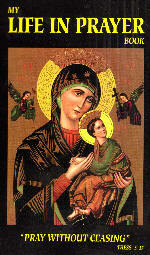 Mary, Mother of God, come to their aid with they powerful intercession.